To order a printed copy of the Clement Windows catalogue, simply click the Request button below. Clement manufacture an innovative range of steel windows, doors and screens for both private residences and commercial projects. We provide a complete service - from the provision of technical drawings through to manufacture, installation and after sales support - whether your project is a traditional restoration project, one involving Listed Buildings or Conservation Areas, or a new build. Our previous work includes prestigious heritage projects across the UK and in the USA, including well known buildings such as Bonhams in London, Norwich City Hall and the Eldorado Building in Manhattan. We take pride in our reputation for premium products, excellent craftsmanship and industry expertise and we are delighted that so many of our customers return to us time and again because they know they cannot get a better window anywhere else. All of our windows are crafted to your bespoke design in our ISO 9001 approved factory. Produced entirely from 100% recycled steel and generally Part L compliant, our windows are environmentally friendly and meet the latest performance requirements for insulation, weatherproofing and security. 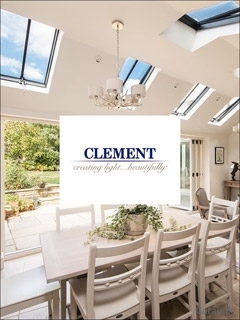 Clement also manufacture a selection of conservation rooflights, available from stock in either a tile or a slate profile. Order the Clement Windows catalogue now for the full range of beautiful windows. Build Your Own Conservatory Its Easier Than You Think! &#8211; We now manufacture our made&#8211;to&#8211;measure PVCu conservatories with more unique design features making self&#8211;assembly even easier and faster than ever before. Make a grand entrance every time with stylish, high&#8211;quality doors fit for any space. Whether for your home, office, garden or garage, come see how a beautiful door can make a difference to any project. Find everything your home needs in on with Garden Trading. They source only top-quality yet affordable furniture, lighting and accessories for your home and garden. Sign up for updates and deals today! By pressing the Request Printed Catalogue button you give consent to Clement Windows (and their Data Processors for the specific purpose of delivering your literature) to send you their Catalogue.